Amado Peña's work is distinctively bold in color, form and dynamic composition. Art is his first love and he has been a successful artist for over 30 years, holding exhibitions all over the United States. 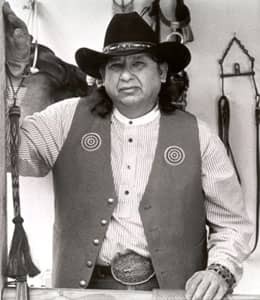 Peña was born in Laredo, Texas of Mexican and Yaqui heritage and is recognized as an Artisan of the Pascua Yaqui Tribe of Arizona--a distinction of which he is particularly proud. He grew up in his father's Mexican-American culture, but as he grew older he learned to incorporate the Pascua Yaqui cultural influences of his mother's people into his art. The land has inspired much of his art, including Canyon de Chelly, Spider Rock, Monument Valley, Enchanted Mesa, Acoma, and Black Mesa. These lands can be uncompromising, and his arts celebrates the strength of the Native people who live in harmony with their environment. Peña earned Bachelor's and Master's degrees in Art and Education at Texas A & I (now Texas A & M in Kingsville.) He has taught art for years and continues to teach at Alexander High School in Laredo, as well as serving as an adjunct professor in the College of Education at the University of Texas. He's an active fundraiser and contributor to many causes.